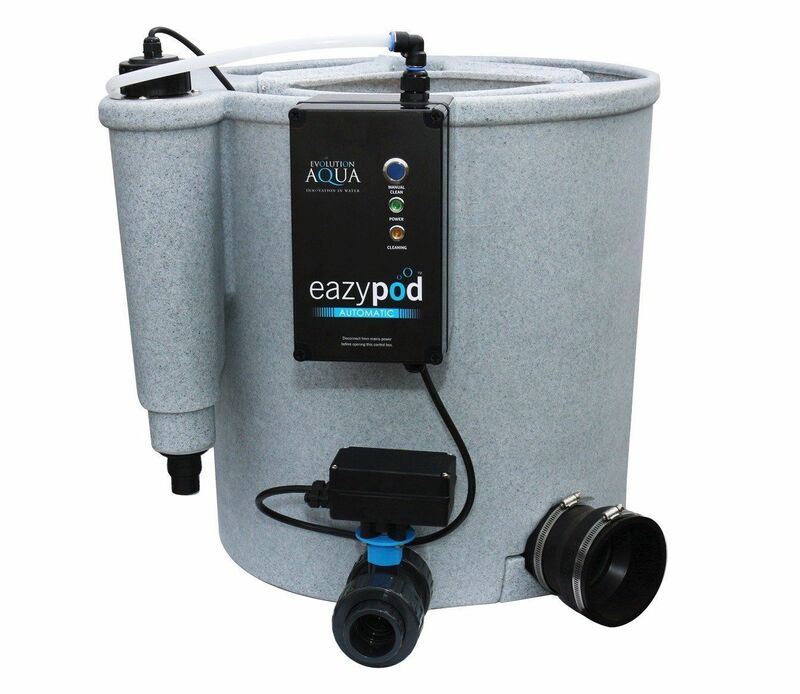 A compact member of the Nexus household, the EazyPod is a mechanical and biological filter system for yard ponds approximately 20,000 litres or Koi fish ponds as much as 10,000 litres. 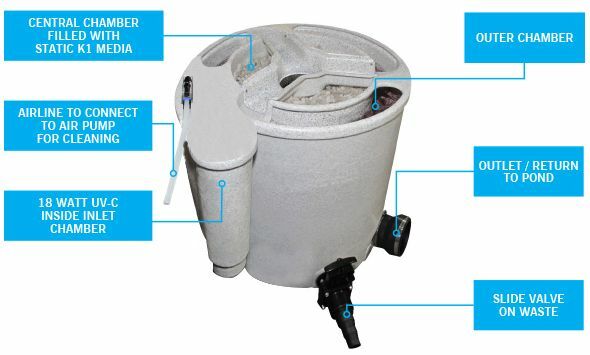 The EazyPod makes use of fixed K1 Micro, which offers improved organic advantages, even when utilizing the EazyPod exclusively as a mechanical waste filter. The EazyPod is offered in grey or environment-friendly colours and can be provided as an EazyPodAir, with an Air Pump 70. 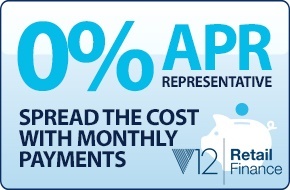 - Mechanical and biological purification. - Really eazy to mount as well as run. 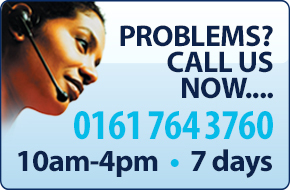 - Quick as well as eazy cleansing cycle. 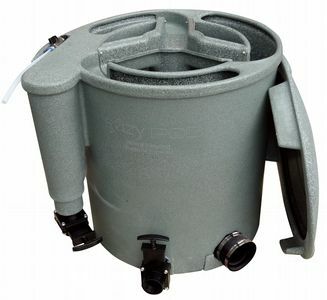 - Works equally well pump or gravity fed. - Perfect as a filter on a quarantine system. - Likewise suitable for use as a pre-filter, polisher or on a skimmer line. 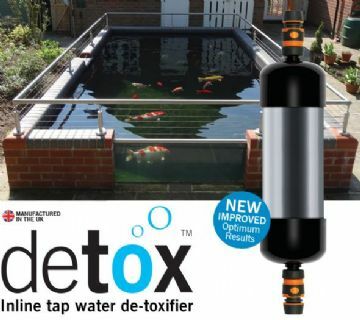 Water from the pond goes into the EazyPod Complete using the inlet, after that moves around the circumference of the outer chamber of the EazyPod, travelling through the stainless-steel grill creating a number of the bigger solids to be removed and settle in the base of the external chamber. This is the first stage of mechanical filtration. As water goes into the main chamber, via the stainless steel grill, the fine smaller solids become trapped in the mass of K1 Micro. Bio-films develop on the safeguarded surface area within each item of media, allowing organic purification to happen. After going through the K1 Micro, the tidy water then climbs as well as overflows right into the inner return pipe as well as flows back to the pond by means of the electrical outlet. The EazyPod is incredibly simple to clean. An air pump is needed for cleaning which perturbs the K1 Micro to free up any particles and also waste that has accumulated within the filter. 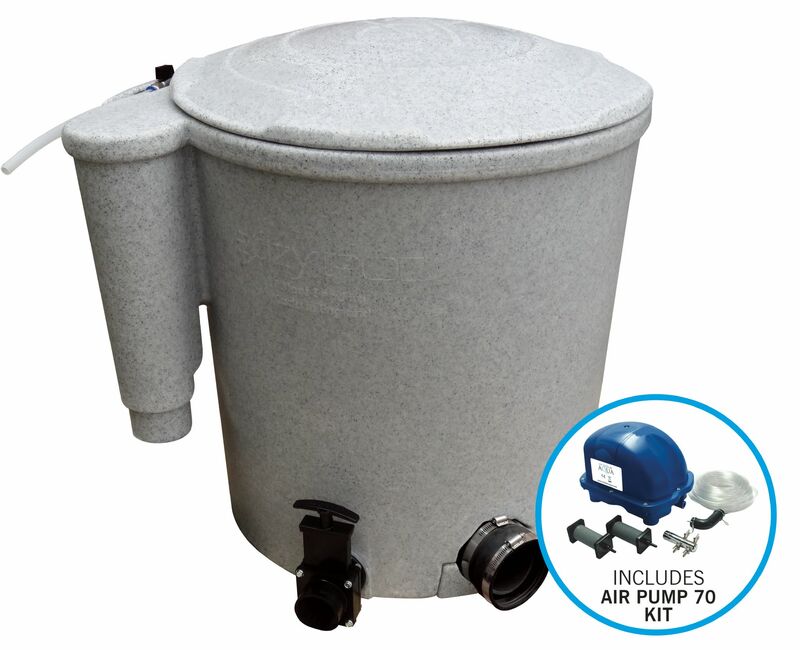 EazyPodAir designs are supplied with a 70 litre each min air pump and also accessory kit. 1. Pond Pump. 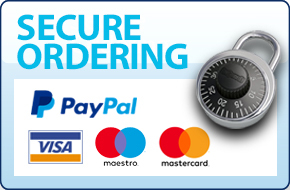 Please guarantee that the pump's maximum real circulation price disappears compared to the defined restrictions. Pump not provided. 2. Air Pump for cleaning the K1 Micro. 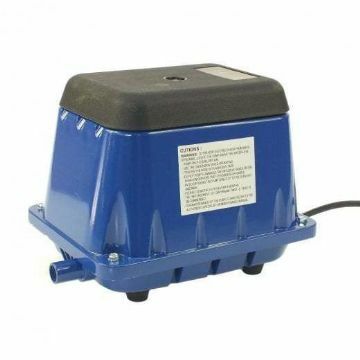 An EA Airpump 70 is suggested. 3. A length of garden tube or braided pipeline (10 mm internal diameter) to attach your air pump to the air ring inside the EazyPod. 4. Idea: When connecting to your air pump, reduced an inch from the airline provided on the EazyPod. Put this into the hose pipeline that connects to the air pump. This will help preserve the hose pipe's rigidity when putting it into the rubber adapter as well as clip supplied with your air pump. 5. Pipeline work from the unit's waste valves to the intended discharge factor. 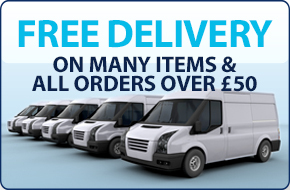 This can be rigid pipe work or a straightforward versatile hose. 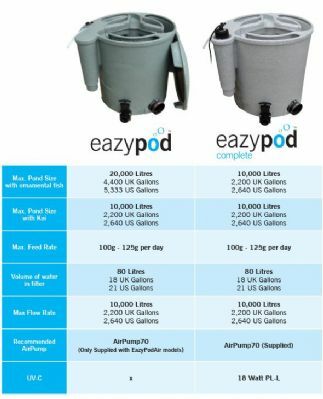 EazyPod Setup Installment EazyPod filters can be mounted on PUMP FED or GRAVITY FED sets up. In all situations the EazyPod should be supported uniformly on a degree base (a paving flag is perfect). Failing to do so can create damages when it has lots of water. It should be a minimum of 600mm x 600mm, to permit very easy access to your valves and also for upkeep objectives. 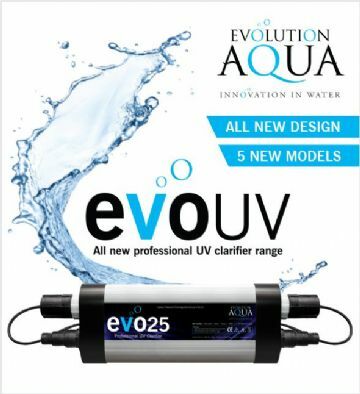 Pump Fed Set-Ups By this we mean that if your pump is going to be made use of to supply the water to the filter, as well as the filtered water after that returns back into your pond via gravity, i.e. down a falls, or through a large diameter pipe, this is referred to as PUMP FED (i.e. the water is fed to the filter making use of a pump). 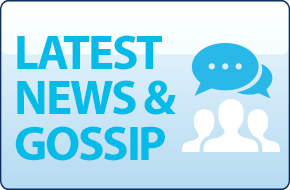 PLEASE KEEP IN MIND: The pump needs to not be put on the base of the pond, as failure in the pipeline job or ports could result in complete water drainage of the pond. The pump ought to be increased a minimum of 12 inches off the ground or high sufficient to leave sufficient water for the fish to survive, in the not likely event that this occurs.